Great insight guys. I am a big fan of presonus gear! I have get one SL16.4.2AI Last March. If you see my account I have several licences from Studio One. Can I Get one copy of SO 3 Pro version? Hi there, I have two questions for you guys, I just got a StudioLive 16.4.2 AI yesterday, I already have a 16.0.2. 1.- Can I install the Studio One 3 in my 3 macs? 2.- Am I going to be able to use Studio One 3 with the 16.0.2 too? That’s OK, we’ll take care of you. Register your mixer when you get it, and then email us at sales@presonus.com, with ATTN: Ryan in the subject line. We’ll take care of your upgrade. Hey guys, i just bought a 24.4.2 AI off of Amazon but it won’t arrive until Nov. 3rd. I’m still in the clear as far as being able to get the download, correct? Also, I am running Artist as of right now. Will i have to delete artist or with the download will it automatically clean it up for me? How does this work? Thanks! Sorry to hear this, William. Please e-mail us at sales@presonus.com with the name of the Rep in question and we’ll see what we can do. I purchased the Presonus StudioLive 24.4.2 AI from musiciansfriend.com about 18 months ago. It has been a great asset, although it didn’t have enough channels for my studio. So on 7/5/2015 I purchased the 32.4.2 AI. I have recorded music and tried to use the software for altering the music and it says I need the professional version. A few weeks ago a Presonus rep from TechrepMarketing was at a music store and I won the Studio One 3 Artist, I was very excited thinking I won the Professional Version. The rep then told me that I had won the artist version and that he would help me out getting the Professional Version. I emailed him as he asked me to. He replied that he was very busy. I waited two weeks, emailed him again, he has not replied, and again he has not replied. So today I try to install the Version that I won, hoping to upgrade it to Professional maybe for a lesser cost. Then I find out that if I would have bought my second mixer after 8/1/15 I would have gotten a free upgrade to Professional. I purchased my mixer just three weeks too early. Is there any way you can help me out? I have purchased $5000.00 worth of these mixers and have missed the upgrade. Nothing until this moment… Unfortunately! Curious, did Presonus give you any feedback pertaining to your question? You will need to make sure the previous owner has de-registered the mixer in order to register it and take advantage of the offer. What if you buy it used off Ebay? No, this offer is for the StudioLive AI Console mixers. Does this offer work with the CS-18 AI? 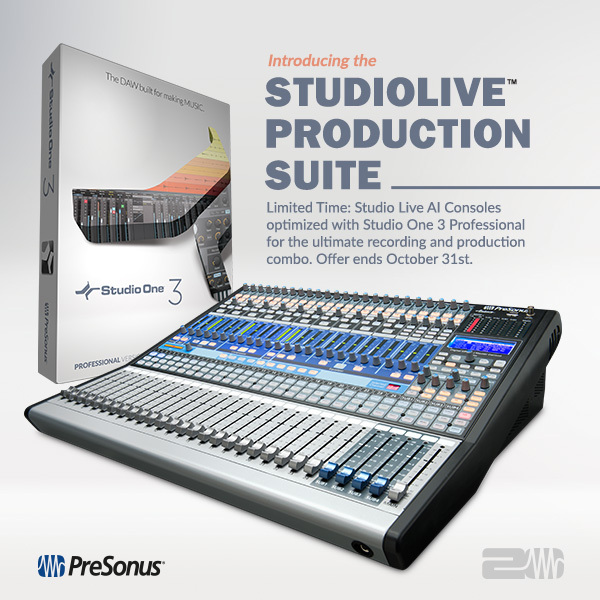 Why don’t you offer free upgrade of Studio One 3 for those that have the Studio One 2 that came with the earlier StudioLive? I have a 24.4.2 and would like to by a 32.4.2AI, but in Brasil it’s very expensive with the economic crisis and the dollar getting R$ 4,00. I have no money and can’t have my system actual. No, this offer is only available on the StudioLive AI Console Mixers at this time. Does this promo include the software for the rm consoles as well? Hi, is this offer available with the Studiolive RM16AI ? I just recently bought the 32ai Great sounding board. Kinda disappointed for the amount of money spent for the board it didn’t come with the professional Studio 3 and that you cant control Studio One using the board is almost unforgivable!! !